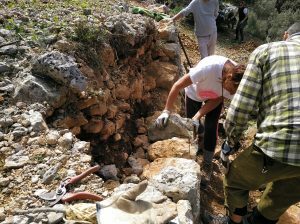 This week we have celebrated the fourth and final day of conservation volunteering with German tourists and residents in the Biniaraix ravine (Barranc de Biniaraix). It been the last of the workshops included on the pilot project carried out by Amics de la Terra with German tourists, aimed at analysing how tourists can actively help in the conservation of the Serra. The first of these volunteering days was in October 2017, the second in April 2018, and the third in October 2018. 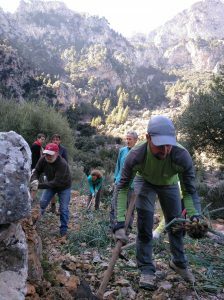 This fourth time, a group of 10 Germans and a couple of volunteers from Amics de la Terra Mallorca, hiked up to the Can’n Silles area of the Biniaraix ravine, to collaborate in the restoration of a dry-stone wall and the cleaning of invasive vegetation in olive groves of the nearby terraces. 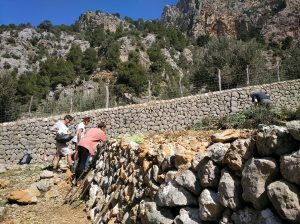 We enjoyed in situ explanations about the natural and cultural heritage of the Serra de Tramuntana, and learnt about the technique of the “margers”, stone-wall masons, with the indications and the great help of Gori Reynés and Marc Fornés. In this practical and unique way, we made more visible the work that these artisanal constructions implies, and the importance of the environmental recovery of the olive groves, which, together with the dry-stone walls, make up the spectacular landscape modelled by the traditional human activities of the Serra de Tramuntana. We also enjoyed a home-made and local lunch in Can’n Gori, where the food gets carried up the ravine, and the non-compostable waste gets transported down, with the help of donkeys. The project “Protect the Serra de Tramuntana” began in late 2016 and is a collaboration of Amics de la Terra Mallorca with BUND (Friends of the Earth Germany) and BTE (Sustainable Tourism Consultants), funded by the German Public Environment Foundation DBU. 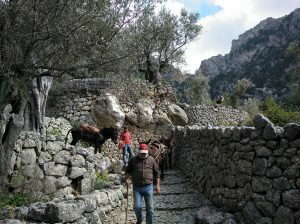 The aim of Amics de la Terra Mallorca, through these specific volunteering days, was to increase the environmental awareness of tourists with practical experiences, thus highlighting the importance and difficulty of conserving this unique landscape declared a UNESCO World Heritage Site in 2011. The final conclusions of all the work lines of this pilot project will be presented on Tuesday 16th of April at the Capvespre Centre in Sóller (16:30–20:00 h), at an open conference.